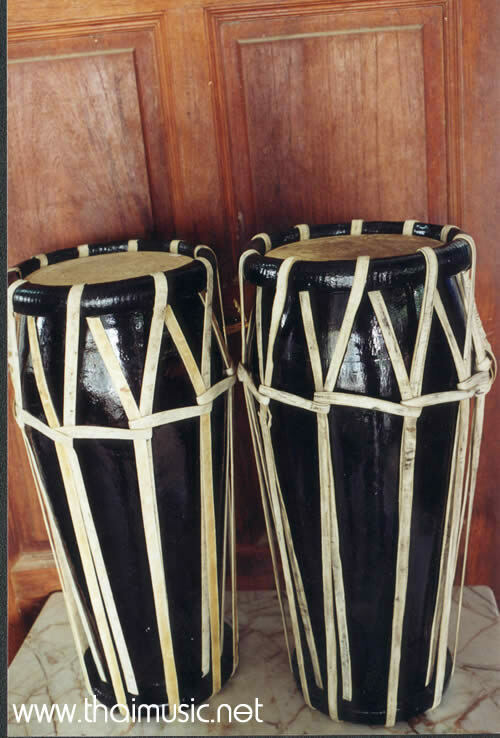 The Klong Kaak is a long cylindrical drum with a similar shape and size to the western style bongo drums. The body is made of hardwood and the drum heads are tied down with leather strips. The two heads are of unequal size, see the second picture. The large head is around 20 cm and the smaller one 18 cm. The heads are made of calfskin or goatskin. 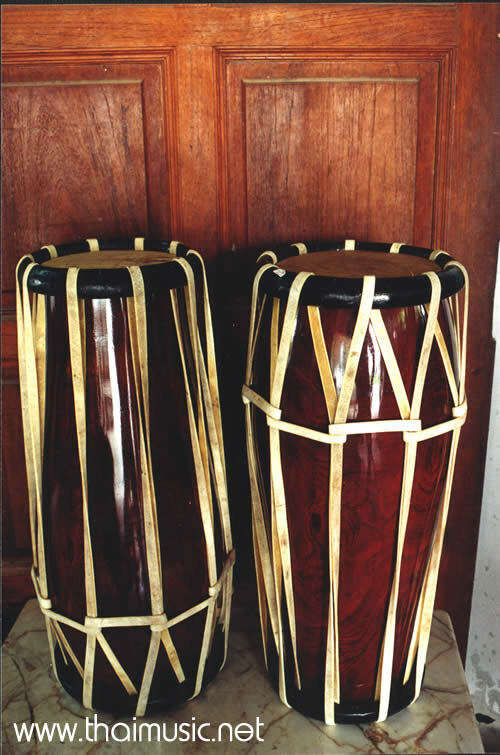 The drums are used in pairs and are of different pitches. The higher toned drum is referred to as tua pu ( "male" in thai ) and the lower toned is called dua mia ( "female" ). They are played with the palms and fingers of the hand, and both drumheads are used. There is one player for each drum . A complex rhythmic line is created by the intermingling and alternating of the sounds of the two drums. This drum is sometimes referred to by the name, glawng cha-wa or Javanese drum. It was thought that the drum originated in Java Indonesia. In the Javanese ensembles ( gamelan ) there are two kinds of drums, one of which is similar to this one. The other is similar in shape to the Ta phon mawn. The Kong Kaak has most likely been used since olden times. In those days the instrument was probably used in Royal Processions. With the King riding atop and elephant or on a river barge. It now appears in the popular Pi Phat ensemble for theatrical presentations. In the late Ayudaya period it accompanied the kriss dance. Also commonly used now days to accompany Thai Boxing.